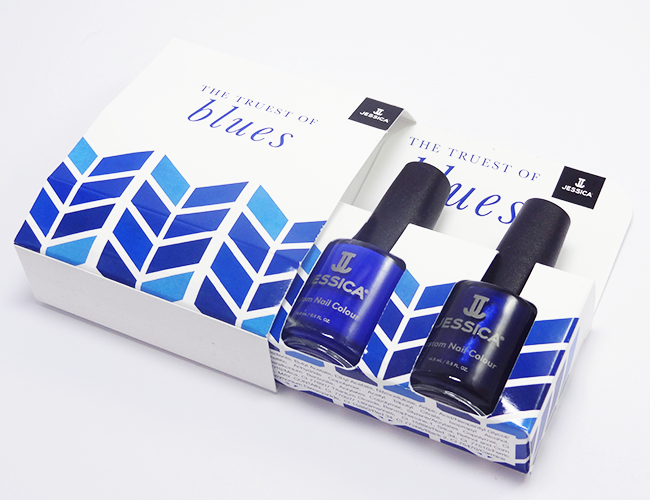 Blue is in this Spring, and today I've got swatches of Jessica's Truest of Blues polishes for Spring 2016 - a cute duo pack of perfect blue hues. Blue is definitely one of my favourite colours, especially on nails. It's been everywhere on the Spring catwalks and Jessica have reflected that in their new duo which contains two full size polishes. Blue Moon is a navy blue shimmer. The shimmer doesn't show up too well on camera, but it's there (you can see a little better in the close up) this is 2 coats plus top coat. Blue Skies is an electric blue creme and my favourite of the two. 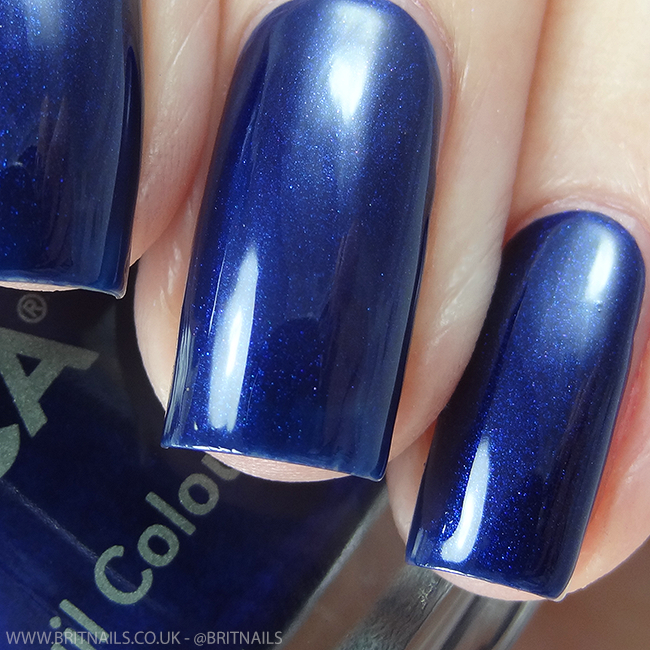 Creamy blues like this are to die for, and the formula here is wonderful - 2 easy coats plus top coat. 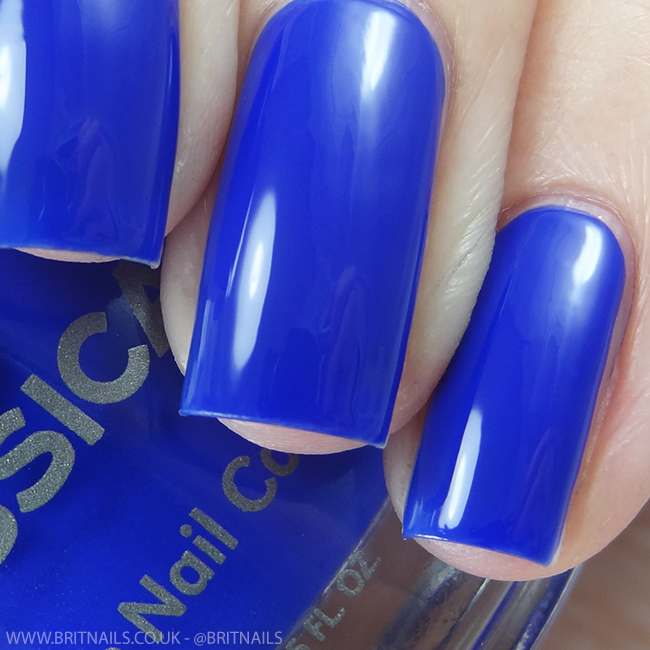 Is blue a colour you like to wear on your nails? Beautiful set. See the name of the bottles from the bottom, because it seems to me that this dark it Blue Skies and the brighter it Blue Moon. I love both of these shades but especially the creme! Also how gorgeous is that packaging? I can just imagine how wonderful the formula is. I only have a few Jessica's but they are perfection. Unnfff blue heaven! I am a fiend for blue polish and these look sensational! I agree with you, I la la love blue polish! Blue Skies is my pick of these two but they're both very pretty. And that packaging? So cute! These shades both look great, and the velvety shimmer of the first shade is perfection. I love blues and I love wearing them on my nails... as long as they don't stain. Please tell me these aren't stainers, they're so pretty! I'm into navy at the moment, wearing nubar navy now. They're both nice, particularly blue skies. Although I've got almost identical colours in my collection of nail polishes. LOVE all things blue, I am actually wearing cornflower blue nails with a blue ombré glitter :) Blue Skies is so pretty!